There are a few things I miss about being in England. Good old Marks and Spencer's is one of them. In my pre-foodie days (and yes, I had pre-foodie days) I loved M&S ready meals. They are one of the few supermarkets who seem to have actually figured out the secret of ready meals that actually taste home cooked. The other thing that I miss about them is their incredibly well stocked fish and seafood section. They always had reasonably priced, decently fresh fish, and I used to buy some almost every week, especially if I hadn't had a chance to go to our local fishmonger. I've tried almost all variety of fish they sell, and I particularly liked their tuna, sole and trout. For a special dinner, I would treat myself to a pack of fresh scallops that I would then sear and serve on a simple lemon pasta. Bliss! Fresh scallops, while available here in Alberta, are ridiculously expensive. I am talking about easily paying over $25 for a pound of fresh scallops. So essentially what was a weekly treat in England is now something that we can, sadly, only afford very rarely here. We do get frozen scallops as well, but there is something about the taste of fresh scallops that is truly a delight. 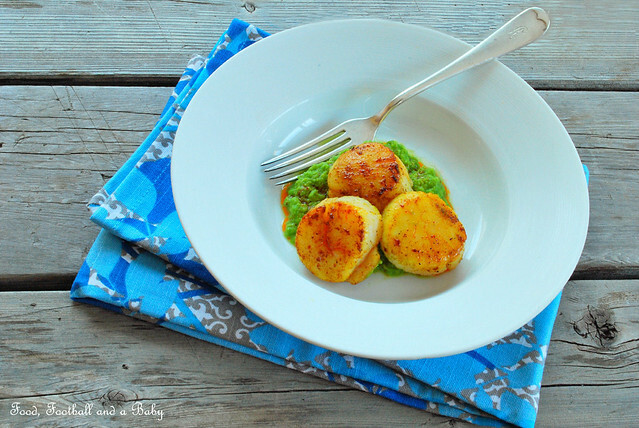 Last week I was helping out my friend Kathryn with her Cook British class, and she decided to make and serve fresh Digby scallops on a minted pea puree and garnished with a mint oil and bacon, from a Diana Henry recipe. My tastebuds were basically zinging away after eating them, and I decided that I would go and buy scallops as a treat for us. And then of course, my food brain went into overtime. So I decided that instead of serving the scallops on a plain pea puree, I would make the entire dish with an Indian twist. I worked on the flavours for this dish for a few days before attempting to make it. First off, I decided that the sweet taste of peas would pair really well with a hint of cumin and fennel. That decided, I thought about how to do the scallops. I wanted something that complemented their subtle sweetness. I also wanted to make sure that whichever spice I used, it didn't overpower the scallops, which are the star of this dish, really. I toyed with the idea of marinating the scallops in a tandoori masala first. But then I decided that I didn't really want tandoori flavours for this particular dish, and so went with the simpler Madras curry powder. I also decided not to marinate the scallops, instead fry them up in a curry flavoured oil, for a more subtle taste. Once that was clear in my mind, I figured I would make a delicate chilli oil to add colour and also another level of spice to the dish. On the whole, this dish is really super simple to make and put together, but it looks so elegant once all the elements are on the plate. Making your own Madras curry powder does add an extra level to this dish, but in a pinch you could go with a store bought mild version. I was actually a bit nervous about how this dish would taste once it was all made, but I needn't have worried. All the elements came together absolutely brilliantly. 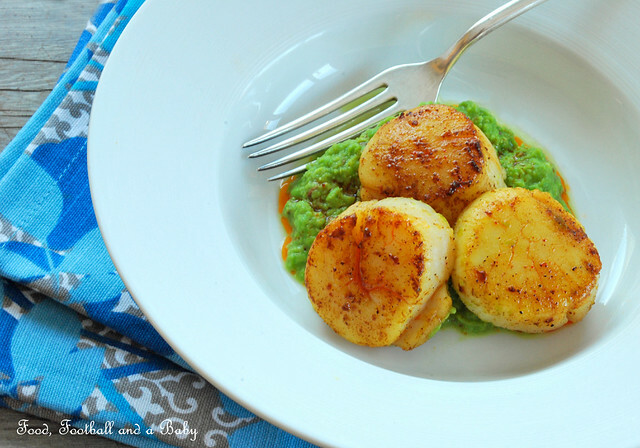 The pea puree was delicately sweet and smoky with the cumin and fennel, and the scallops were just gorgeous! Very lightly spiced, their sweet flavour just shone through and was enhanced by the subtle spicy, lightly charred flavour of the curry powder. The chilli oil really brought all the spicy, salty, sweet flavours together and added an extra hint of mild heat to the dish. 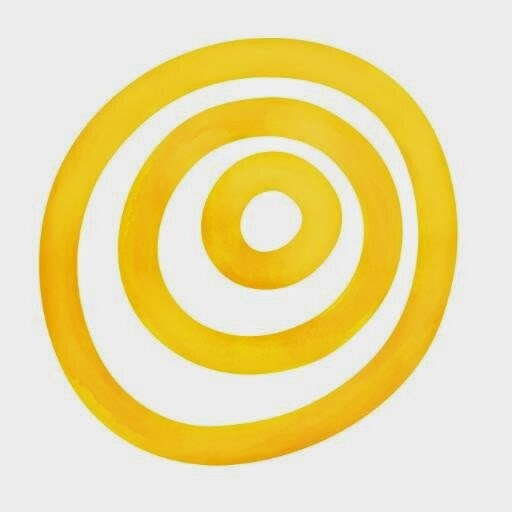 As it turns out, this is my two hundredth post on this blog. Holy scallops...!!! 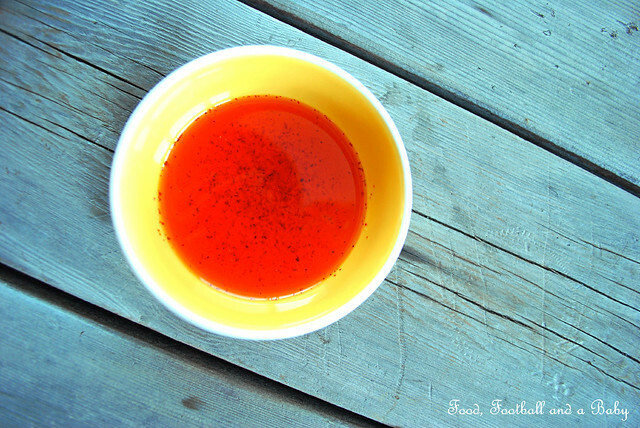 3/4 teaspoon or salt to taste. Make the chilli oil first. Toss the chillies in a hot pan for about 1 minute, stirring constantly. Using a mortar and a pestle (or a spice grinder) crush very coarsely. Whisk together the crushed chillies, oil and salt, and leave to infuse for at least 1 - 2 hours, ideally 4 hours to overnight. Using a fine sieve, strain the oil into a clean bowl, discarding the crushed chillies. It will keep for a week or more (I haven't tested it any further) in the fridge. To make the cumin and fennel scented pea puree, bring a pot of water to the boil. Place the peas in the boiling water for 3 - 5 minutes, until tender. Drain and refresh under cold water. Heat the oil in a small pan, and add the cumin and fennel seeds. Toast for about 30 seconds, constantly stirring, until the seeds start to crackle. Place the peas in a blender, and add the cumin and fennel seeds, along with any oil in the pan. Puree to the consistency of your liking. I like it medium coarse. Use a few tablepoons of water to help puree the peas, if you have to. Season with the salt or to taste. This pea puree can be made in advance as well, and kept in the fridge. Reheat gently before serving. Make the spiced scallops. Rinse and dry the scallops thoroughly. Heat the oil to just below smoking point. Add the Madras curry powder and quickly toast for 30 seconds. Add the scallops in a single layer in the pan. They should sizzle as they touch the hot pan. Sprinkle over salt and pepper to taste. 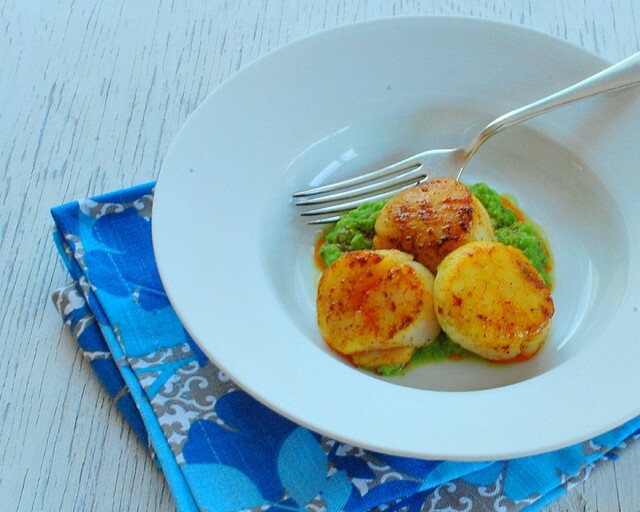 Depending on the size of your scallops, fry for 2 - 3 minutes on each side, until caramelized. Keep shaking the pan as you fry them, and take care not to overcook them. To check if they are cooked, press lightly with your finger on top. If the scallop is firm, its cooked. To serve, place a few tablespoons of warm pea puree on a plate. Top with three scallops, and drizzle with the chilli oil. Serve immediately. Your photos are beautiful Michelle. Always nice to stop in have a look at your blog. I was just talking to someone about how great peas are and now you have a fantastic sounding recipe. Any time I hear "pea puree" I think about the great scandal from Top Chef. Scallops are one of my favourite foods and this sounds a really nice twist on the usual way of serving them. Not sure I could do without the classic mushy peas with my fish and chips but I'm keeping an open mind. Congrats on your 200th blog post! Here's to many more to come! I don't always comment, but I always read! I am with you on scallops; to think they were chopped up and sold as scampi! The question I have is how do you get your Kashmiri chillis? i do a lot of stir fry and they sound ideal for that.